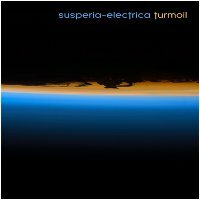 Earth Mantra welcomes Nick Fortune to our humble netlabel, with his superb electronic ambient release Turmoil, under his project name Susperia-Electrica. We at Earth Mantra are fairly well tuned in to the ambient community and are aware of thousands of the artists in the genre, quite a large cross section of the entire community. But surprisingly to us, somehow Susperia-Electrica flew beneath our radar, despite the quality of the music and the sheer number of albums he has released. We were rather astonished when we realized what a superb ambient artist Nick is, and we were delighted to have found a new collection of music to listen to and enjoy. All this is to say that when we first sat down to listen to Turmoil, we had no idea what to expect. But after listening, we knew that this album had to be released. Turmoil is a terrific collection of ambient space music pieces of remarkable clarity and diversity. The music is particularly striking in its range of emotions and feelings. The album opens with a number of pieces, like Turmoil , that are clever fusions of space music and power drone, pieces that are a bit brash and command immediate attention from the listener. But the music quickly evolves into a more placid and contemplative mood, such as the beautiful A Night With The Wolf Moon, On The Edge Of Space, and Oceans Above. But even still, Nick peppers his tracks with the occasional shrewd divergence, such as the abstract minimal piece Sleeping With The Stars. Truly there is something for everyone to love in this delicious release. Nick reports that: "Names of albums usually surface after the first couple of tracks are finished. Turmoil came to mind when I had just finished the full-length track Turmoil . It made me think about all the things that have been going on with our planet in recent years: global warming, floods, earthquakes, and volcanic eruptions, to name just a few. But there is also peace to be found throughout the universe, which can be felt in the more quiet tracks on this album." Indeed, the title of Turmoil may be a bit misleading about this release, since the track progression really represents the act of overcoming chaos more than it is about the chaos itself. Whatever the thematic interpretation, however, this is simply beautiful ambient space music, very well constructed, immaculately produced, and with a brilliant evolution across the length of the album. Exceptional music that is highly, highly recommended. So it is with great pleasure that we add Nick Fortune of Susperia-Electrica to the list of artists who call Earth Mantra home. We hope to hear much more from this talented musician in the future. What a powerful album! As I'm re-listening to Earth Mantra's back-catalogue of albums, I keep re-discovering genuine gems of music. This one is space ambience at its best; not afraid of venturing into brave melodic territories and exploring noise in all of its manifestations. Well worth a listen. Very atmospheric and refreshing to listen to. The music is neither dark nor light but taostically positioned in the middle. The sound is "big" and very visual, and thus perfect for a surround-sound space experience, so get your best headphones out! Easily one of my favorite space-ambient albums.